I've had a really nasty head cold that then settled into my chest. I thought maybe I was getting walking pneumonia and went to Urgent Care, just to find out it's only a cold. I felt like an idiot but I was glad I had medical insurance so I could go. I've been struggling with high blood pressure for the last 6 months (that I knew about, but probably for much longer that I didn't know) so I was feeling worse cause the cold meds I was taking were raising up my already high blood pressure. Now I have to suffer through the rest of this cold without meds...yay. Sigh, so just another thing slowing me down. Anyway before all this happened I was working on a bunch of new stuff. I'm taking Sassy Pack Rat Studios into a slightly different direction. 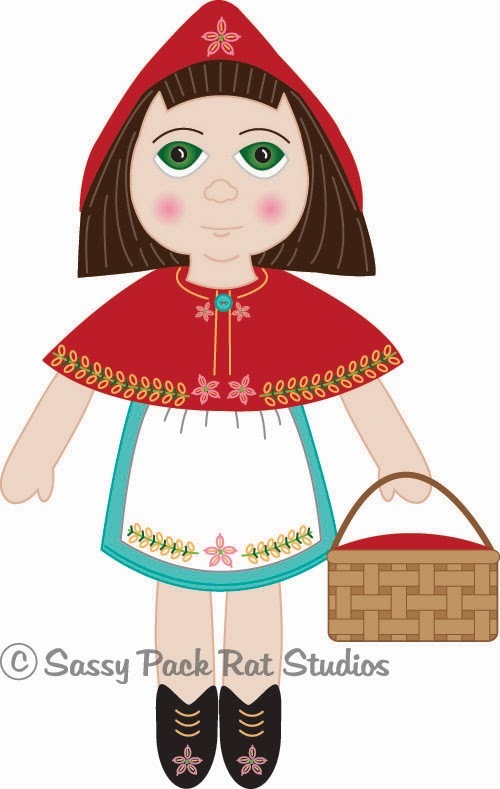 I've always wanted to make dolls for the children's market, so am adding some dolls specifically for children in addition to my other art dolls. This is one of the doll designs I'm working on. She will be printed on cloth and then sewn. I have a whole fairy tale set I'm working on. They will be made from my own illustrations and based on my small felt dolls from last year. If they prove to be successful then I plan to offer custom dolls too. There are other things I'm working on that are geared toward children. I am still working on soft sculpture dolls for adult collectors but I hope that the children's dolls do well. Join my newsletter to be the first to know when these are available in Summer/Fall 2016! Take care of yourself:) I had influenza for about 3 1/2 weeks and because I wasn't at my best did manage to get walking pneumonia...oh joy oh boy what fun....not.